Database views are virtual tables which are built up using a SELECT query. The query may contain one or more tables. So lets create a view of the data joining the two tables together and presenting certain fields. Instead of selecting from the tables, the application developer would select from the view “vwStaff” to retrieve the data they needed. There is no performance difference between running the SQL or running database views. 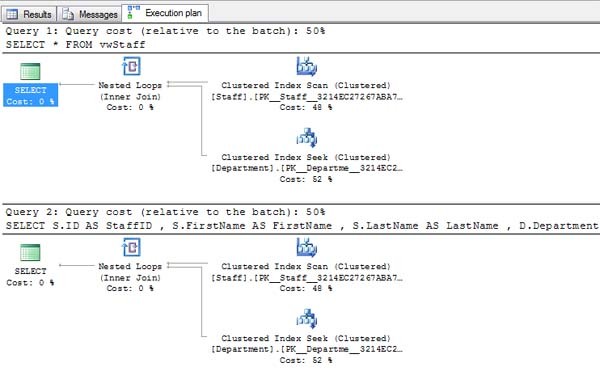 If you look at both SQL Server and MySQL, the execution plans are identical between the SQL and database views. Data protection – create views to protect sensitive data. For example the salary column was hidden in my example above. Code re-use – simplifies application development. If some business logic changes for presenting data, change it once in the view and not many times in different places. Simplifies access to data for untrained users. Lets say you have a department of data analysts who are experts with Excel but can’t write SQL. Create them a view of the data and have them load that into Excel. They can’t write SQL but they can choose a view from a list of available datasets – everyone is happy. Performance – lets say your data analysts can write SQL but you don’t want them writing run-away queries which bring your database server down. Create them a view instead of allowing them direct access to the data. If you are using BCP to export data, you can format the data through views as BCP data formatting is rather limited. Working around non-deterministic function limitations. Ease of use – you’re probably thinking, what’s he talking about? Well it is very easy to think “I’ll join to that view I created in the database to satisfy this new query I am writing”. You have to remember that database views are SELECT queries. Every time you run one or join to one, the query is run on the fly to produce the results of the view. As an author of a query and using the view above, if you only needed access to the data in the “Staff” table to form part of your query, why join to a view which pulls in data from the “Department” table? That is extra IO overhead which when dealing with large volumes of data or frequent batch requests can have negative performance implications. It is better to have access to either the table (if you are allowed to) or another view of the “Staff” table which allows you to view the fields which you require and use that. Nested database views – don’t create views based on other views as this has a negative performance impact. Better to create views from the base tables. The foreign key constraint is an important aspect of database design. This article explains why. The purpose of the foreign key constraint is to enforce referential integrity but there are also performance benefits to be had by including them in your database design. Firstly lets look at an example of how they are used in database design. So here are my two tables. Now we’ll insert some data. Let’s have a quick look at the data. So we have inserted rows into table “Orders” which relate to “Accounts” by the AccountID and ID columns respectively. No problems with that. What happens if we try and insert a new row into “Orders” for an account which does not exist in table “Accounts”? Msg 547, Level 16, State 0, Line 1 The INSERT statement conflicted with the FOREIGN KEY constraint “FK__Orders__AccountI__0AD2A005”. The conflict occurred in database “DBADiaries”, table “dbo.Accounts”, column ‘ID’. So the foreign key constraint is doing its job and only allowing recognized account ids to be added to the “Orders” table. The DELETE statement conflicted with the REFERENCE constraint “FK__Orders__AccountI__0AD2A005”. The conflict occurred in database “DBADiaries”, table “dbo.Orders”, column ‘AccountID’. Cascading deletes are turned off in this instance so as well as stopping bad data getting into the table, the foreign key constraint is preventing data from being deleted which in this case is exactly what I need it to do. How can a foreign key constraint benefit performance? Well let’s have a look at this simple example using the tables previously created. Re run the preceeding SQL statement and check the execution plan again and it has changed. Could a foreign key constraint become untrusted? For example you might decide to disable a foreign key when loading in large amounts of data. It is easier to batch insert consistent rows of data into a database without foreign keys enabled. An untrusted foreign key would mean that the second execution plan would be used for the query which will not perform as fast as the first. If you had tables with lots of rows in, this could make a massive difference to performance. You could also look for all untrusted foreign keys in your database as part of a performance tuning exercise. So a foreign key constraint has advantages and should be part of your design to ensure that you have a consistent database and to help ensure that the database performs optimally.